It's Manly Monday with My Creative Time, a day to try to make a masculine project. I'm not sure if I hit the mark on this one, but I tried to keep it simple and stick with just shades of blue. At the same time, I was trying out a new technique that I learned in the StampNation site: creating faux layered covered dies. The My Creative Time circle dies from the You Are Spot On stamp and die set were perfect for this technique! I started by die cutting the three larger circles two times each out of a 4 1/4" x 5 1/2" piece of white cardstock. I then lined up a piece of light blue cardstock underneath the white piece and placed slightly smaller dies within each circle, removing the white piece, and running the light blue piece through my Vagabond. I repeated this same process with a medium blue piece of cardstock. I then adhered all of them onto a navy piece of cardstock, which I adhered to my card base. 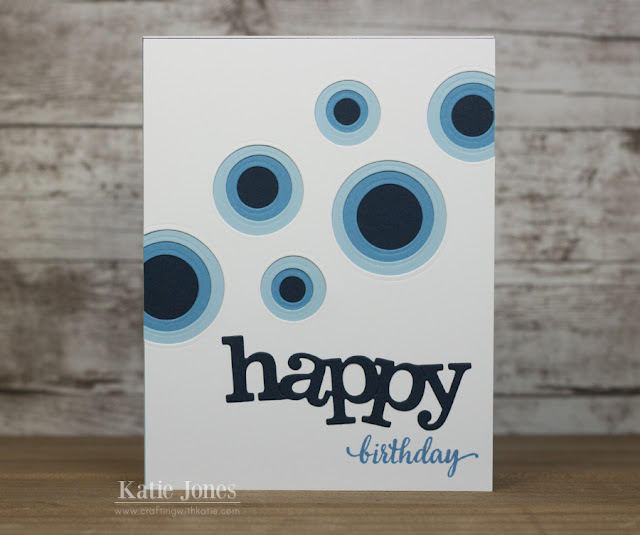 The "happy" die cut was made with a die from Happy Everything, and the "birthday" stamp came from that set as well. I think this is a great masculine card! I like the blues, and the new technique you used looks really awesome. I like the layered circles...definitely could be used for a masculine card. What a pretty card and wonderful design and technique. Great job.